Now recognised as one of the key figures in the Allied victory in World War Two because of his role in breaking German codes, as well as being the father of modern computing, Alan Turing was a relatively obscure figure for many years. His profile gradually increased from the mid-1980’s onwards, when a West End play Breaking the Code was staged about his life, culminating in 2013 with a Queen’s pardon for the charge of gross indecency that ultimately led to his suicide. Now Turing’s story has finally hit the big screen in this scintillating thriller directed by Morton Tyldum. Graham Moore’s beautifully-paced and gripping screenplay for The Imitation Game is based on Andrew Hodges’ book “Alan Turing: The Enigma”. Rather than take us in a a linear fashion from Turing’s wartime work to his tragic demise, Moore cleverly interweaves three periods in his subject’s life in such a way that we are left not just with a sense of tragedy, but also of Turing’s great triumph. The bulk of the story concerns the war years at Bletchley Park, but we also see Turing during his school years and in the 1950s during the period when he was investigated by the police, arrested, and subsequently found dead at home. The concept of the ‘imitation game’ is explained to a police officer by Turing (Benedict Cumberbatch), whilst being interviewed after his arrest. Taken from a 1950 scientific article by Turing (not actually called ‘The Imitation Game’, contrary to what the film states), the game imagines an interrogator trying to distinguish between a thinking machine and a person, both unseen, on the basis of typed responses to questions. In order for the machine to bamboozle the interrogator its best strategy is to try and imitate a person. 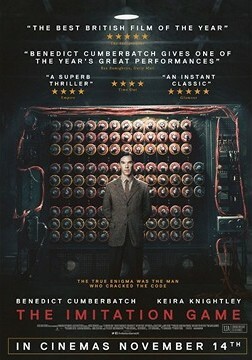 The central conceit of the film is to portray Turing as a machine. Remarkably intelligent, even as a schoolboy, Turing doesn’t really know how to interact with others. He takes other people’s spoken utterances entirely at face value, failing to appreciate the intended meanings and not comprehending jokes at all. Although initially a subordinate in MI6’s secret team of codebreakers, Turing is frustrated that he cannot get the others to appreciate his ideas. After appealing directly to Churchill, Turing is put in charge but then is faced with the challenge of leading and motivating others whilst lacking any noticeable social skills. Gradually, Turing learns some of the aspects of normal interaction, especially in his chaste romance with the team’s only female, Joan Clarke (Keira Knightley). But does Turing really understand and feel any of this, or is he just imitating normal human behaviour? Surprisingly, several scenes are extremely funny. Turing’s portrayal here will surely spark a flash of recognition in readers of the British adult comic Viz, as Turing’s behaviour bears a striking resemblance to that of Mr Logic (it has, in fact, been suggested that Turing may have had Asperger’s Syndrome, though retrospective diagnoses are notoriously difficult and we can’t say for sure that this was the case). After working for months without success, and with the whole project under threat, a chance remark in a bar leads Turing to realise how the German codes can be broken (this scene is reminiscent of the one in A Beautiful Mind where Russell Crowe’s John Nash explains – wrongly, unfortunately – the concept of the Nash Equilibrium). However, once the team discover they are able to decode German messages Turing reveals a terrible truth: the British military and intelligence services cannot use this knowledge to prevent all the German attacks they know are being planned. An activity as complex and mathematical as codebreaking is not one that lends itself naturally to drama, but Graham Moore’s first-class script and Morten Tyldum’s direction do a terrific job of ramping up the tension and making the story exciting. Benedict Cumberbatch is perfect as Turing, but the real revelation for me was Keira Knightley. She gives a passionate and stirring performance as Joan Clarke, a proto-feminist figure of blazing intelligence, who herself had to engage in an imitation game – pretending to be something she wasn’t – in order to satisfy her parents’ more traditional expectations for their daughter. Finally, a word must go to Oscar Faura’s cinematography, which I thought was outstanding. Although principally a biographical drama, I would say that The Imitation Game also deserves to be considered alongside more action-oriented movies as one of the great war films.